The new 11.6-inch display is the largest and most advanced infotainment screen ever offered by Subaru. Following last week’s teasers, the has debuted at the 2019 Chicago Auto Show with a new platform, a new turbo engine, and advanced interior tech. Billed as "the most advanced Legacy in the model’s 30-year history,” the seventh-generation Legacy rides on the , which underpins the Impreza, Crosstrek, and Forester. Compared to the previous Legacy, the new platform's structure is 70-percent stiffer in both torsional and front-suspension rigidity and 100-percent stiffer in both front lateral flexural and rear subframe rigidity. As well as strengthened suspension and lowered center of gravity, the Legacy’s improved body rigidity provides more responsive steering and handling, a smoother and quieter ride, and improved crash protection, with the new body absorbing over 40-percent more energy in front and side crashes than the current model. For the first time since 2012, the Legacy line-up includes a turbocharged engine. As standard, the XT model is powered by a 2.4-liter turbocharged boxer engine that delivers 260 horsepower and 277 lb-ft of torque. Mated to a high-torque Lineartronic CVT with manual mode and steering wheel paddle shifters, the powerful turbo engine launches the Legacy XT from 0-62 mph in an estimated 6.1 seconds while still delivering impressive fuel economy estimated at 24/32 mpg city/highway. Other models get the upgraded 2.5-liter Boxer that , which produces 182 horsepower and 176 lb-ft of torque. Also paired with a Lineartronic CVT, the 2.5-liter Boxer unit enables the new Legacy to hit 0-62 mph in 8.4 seconds and, with the assistance of standard Active Grille Shutters, achieve an estimated fuel economy of 27/35 mpg city/highway. Complementing the more powerful and refined powertrains is an all-new suspension that is lighter, stronger and more responsive, combined with 17- or 18-inch alloy wheels, grippy all-season tires, and four-wheel ventilated disc brakes. Visually, the 2020 Subaru Legacy doesn’t look drastically different from its predecessor, but there are some subtle changes that make it look slightly sleeker. Wider fenders give the sedan more presence and the trunk surface has been raised, while a frameless hexagonal grille and lower grille add further width and sportiness. The side-mirror design has also been reworked. Bigger changes can be found inside the overhauled cabin. The Legacy’s interior is dominated by an all-new tablet-style 11.6-inch display, which is by far the largest and most advanced infotainment screen ever offered by Subaru. It comes as standard on Premium, Sport and Limited trims and offers touch controls for multimedia, HVAC and vehicle settings, as well as Near Field Communication. Navigation powered by TomTom and voice-activated navigation is optional for Premium, Sport and Limited and standard for Touring trims. The Base model also gets an all-new multimedia system, with dual 7.0-inch displays. All models come with Subaru’s EyeSight Driver Assist Technology as standard, which now includes a Lane Centering Function that provides steering assist when the vehicle veers outside its lane. A DriverFocus Distraction Mitigation System is also optional on Limited and standard on both XT trims, which uses a camera and facial recognition software to detect driver fatigue. Also new is the addition of a Front View Monitor offered as Standard on the range-topping Touring XT. The system uses cameras to monitor blind spots and display a 180-degree view on the 11.6-inch display. Other available driver-assists include LED Steering Responsive Headlamps for Limited and Touring trims, Reverse Automatic Braking and Blind Spot Detection with Lane Change Assist, and Rear Cross Traffic Alert. 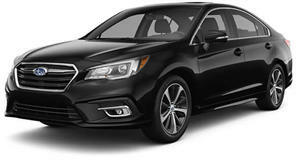 The 2020 Subaru Legacy will arrive in dealerships this fall and will be available in Base, Premium, Sport, Limited, Limited XT and Touring XT trims. Pricing will be announced closer to the on-sale date.